A Christmas surprise and mild weather this January has offered me a chance to create my first dronie. Now I figured this new word was out there already and sure enough it was. Like a selfie, a dronie is picture but taken by a drone. Compared to others I know I’m not “into” gadgets that much. One problem I see with gadgets is the high cost for something that the bugs are not worked out of yet. I believe early adopters pay the price for being too early. I’m a novice in the drone world. Novice sounds young so it’s an alright label by me. I categorize the retail drones in 3 groups. First very small indoor type drones, next the outdoor type with limited controls and finally full featured ones. The full featured ones start about $600 and go up from there. I suspect their GPS and avoidance features allows beginners better control. My gift drone fits into my second category. No GPS, no live video streaming and no automatic avoidance system. The drone I’ve been crashing (not sure if I could call it flying yet?) is very light which is good and bad. Good because knocking it down as it came toward our adult daughter with my hand worked fine without any cuts. Bad because a slight breeze will push it around. My first attempt of flying confirmed my belief that all this drone delivery talk is just hype to gain attention. Sure the commercial drones will be heavier with more powerful motors but I don’t see them delivering during a thunderstorm or even a high wind day. Sorry that same day delivery was cancelled due to an act of God. Quick story about one of my first attempts. Granddaughter of 5 was over recently and I thought I would just show her (amaze her?) how it worked by lifting off and landing quickly on our deck. It was cold out but not bad for winter. I told her stand behind me. It lifted up about 4 feet caught a breeze and crashed into the deck railing. Took about half a minute total. Seeing this she told me, “It’s cold out I’m going back inside now.” Smart kid. 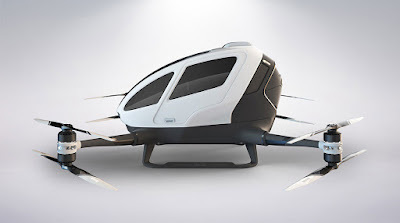 Now that I’m giving more attention to drones, I found this upcoming drone concept. I’m wary of the whole idea. A personal taxi drone called the EHANG 184. The Chinese company is currently test flying prototypes. No pilot, just the passenger and well tested software. I’ve flown in small helicopters which are fun but expensive. I've never felt scared since I had just watched the pilot land and take off with other customers before me. This no human pilot thing? No way, I’ve worked on too many software bugs in my career.